MOREHEAD CITY – The N.C. Division of Marine Fisheries recently certified two new state record catches, one for scamp and the other for gag grouper. Toby Grantham of Knightdale caught the 27.6-pound scamp while fishing off Atlantic Beach Sept. 25. The fish measured 40 inches in total length and had a 26.25-inch girth. Grantham caught the fish with a Shimano Stella 8000SWPG rod and Black Hole Cape Cod Special 54S 250g reel, using a Blue Water Candy Roscoe Jig on 50-pound line test. The world record scamp weighed 29 pounds, 10 ounces and was caught off the coast of Alabama in 2000. 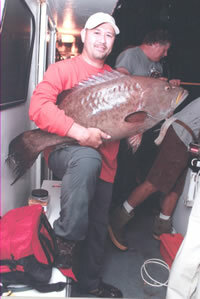 Timothy Gallimore of Ocean Isle Beach set the state record for gag grouper with a 46-pound fish he caught May 1, 2011 on live bottom in 200 feet of water southeast of Ocean Isle Beach. The fish measured 44 inches from the tip of the nose to the tip of the tail and had a 28.5-inch girth. Gallimore used live pinfish for bait on 80-pound braid line test with a Shimano TLD 25 reel on a Penn Standup rod. Gallimore’s gag grouper was caught previous to and replaces the record 43-pound, 8-ounce fish caught May 12, 2012 off Morehead City. 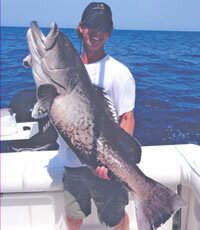 The world record gag grouper weighed 80 pounds, 6 ounces and was caught off the Florida coast in 1993.